A few weeks ago I spotted this sign while dining at Red Robin. Although I was interested in what the cupcakes actually looked and tasted like, I was in no mood to try cupcakes. Since it was during the holidays, I had been stuffing myself with cookies, baked goods, and pies. I just couldn't eat any more sweets that day. 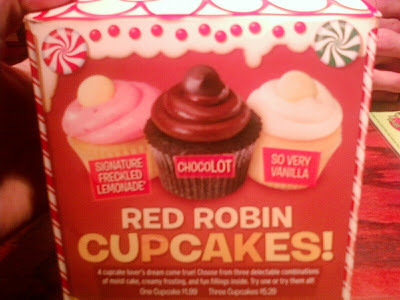 Three cupcake flavors are available at Red Robin: Signature Freckled Lemonade, ChocoLOT, and So Very Vanilla. They cost $1.99 each or 3 for $5.29. Has anyone tried them yet? Thoughts? I got really excited when I saw them at red robin and made sure I had enough room to eat one but I was disappointed. The cake was pretty dry and I could taste the grainy sugar in the frosting. They don't specialize in cupcakes though, so I have to give them that. Uuummm... well.... I like RR for their burgers. The thought of cup cakes from them seems over-commercialized at that they would tasted microwaved. Not saying the have poor products in general. I'm just thinking the cupcakes aren't so good if you aren't a bakery.